If you haven’t had your dental implants placed by our dentist in Lincoln, what are you waiting for? Dental implants enhance the health of your smile and make eating fun again. Plus, they look fantastic. Dr. Hoffman has the experience and training to restore your missing teeth by safely placing your dental implants. Unlike dentures, implants never need to be removed for cleaning. In fact, you care for them the same way you take care of your natural teeth, with a daily home care regimen. The major difference is that with dental implants your need to select gentle products that won’t scratch the porcelain crown or the titanium fixture. 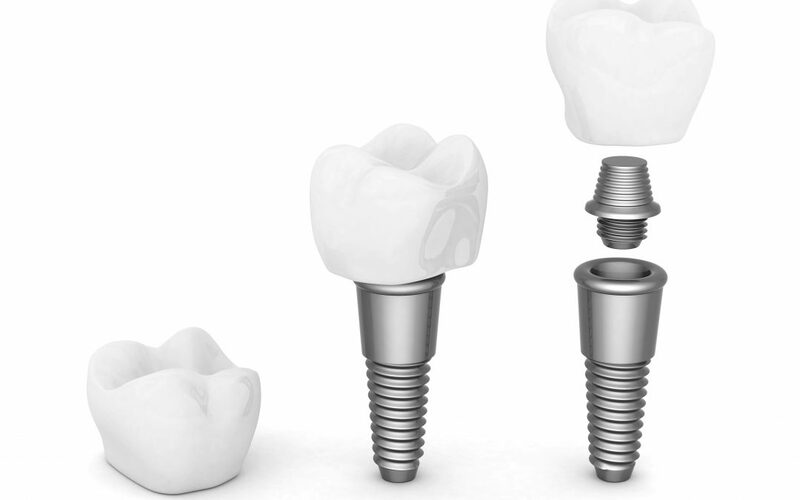 You also want to avoid irritating the soft tissue around your dental implant. Whether you have dental implants or not, effective daily hygiene and regular checkups are essential for preserving your smile. You should brush your implants and floss around them twice daily, just like you do with your natural teeth. It’s also important to rinse with mouthwash twice a day for effective dental hygiene. These habits will protect your smile from plaque, tartar, and debris that could otherwise cause tooth decay and gum disease. Your dental implants are fully resistant to decay, but they are subject to a condition called peri-implantitis, an infection that attacks the soft tissue around the base of a patient’s implants. Proper implant care is crucial for preventing peri-implantitis. There’s been a lot of research on the safety and effectiveness of various types of toothbrushes for use with dental implants. The overall conclusion of this data is that both electric and manual toothbrushes can be effective for use with dental implants so long as you select a toothbrush with soft bristles and thoroughly brush all sections of your mouth for at least two minutes each time you brush. There are certain types of toothpaste that contain abrasive ingredients that could damage your implants, including smoker’s toothpaste and stain-removing toothpaste. You also want to avoid any toothpaste containing sodium fluoride, baking soda, or stannous fluoride. An interdental cleaner such as dental floss removes debris from between your teeth. This is very important for preventing infection. When you buy floss, select a variety that’s nylon-coated or one that’s specifically designated for use with implants. Many patients find plastic-coated interdental brushes to be an effective interdental cleaner. Rinsing regularly with mouthwash helps prevent bacteria that causes tooth decay, gum disease, and peri-implantitis. For use with implants, you definitely want to avoid whitening mouthwash because it contains abrasive ingredients. Mouthwash that contains alcohol should not be used because it causes dry mouth, a condition that interferes with your body’s natural process for protecting your smile. If you want to learn more about what dental implants can do for your smile, contact us at Implant and Family Dentistry in Lincoln to arrange your consultation with Dr. Hoffman. Your new smile is closer than you think!